Around the World (and into the Future) in 80 Days on Linz’s Main Square and in the New Ars Electronica Center. On October 3, 1872 at the break of day, Phileas Fogg set out on his journey around the world in 80 days. His modes of transportation were horseback, railway car and steamship. It’s a gripping tale, describing countless adventures but above all the dramatically shrinking distances on our planet. Inspired by Jules Verne’s classic, Ars Electronica, voestalpine and Linz09 dispatched the city of Linz on a ‘round-the-world trip. But this one didn’t ride ships or trains; the journey was strictly virtual via optical cables and satellite links. The destinations were 20 locations in which the future is being conceived and mastered. Or hindered and decimated. Journalistic, artistic and scientific approaches to the key problems confronting our future, such as climate change, terror, genetic engineering, migration and satisfying our energy needs brought out a stark picture of our globalized, networked world. But the focus wasn’t solely on global issues; local perspectives and personal narratives were accorded due consideration as well. 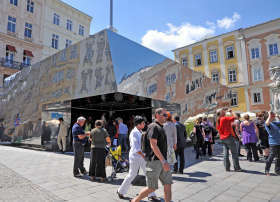 The venues were Hauptplatz and the Ars Electronica Center, whose GeoCity installation provided a virtual (data) environment for individualized world travel. On the 81st and final day, a global conference brought together all the locations, issues and protagonists—a stellar conclave that was a highlight of the 2009 Ars Electronica Festival. The reception accorded 80+1 was just as great—the attendance at the events staged on Hauptplatz was excellent.